Your face become flushed when blood rush to the blood vessels on the surface of the face. Know its major causes and find out the best treatments to rid it. Sudden, unexplained reddening of the skin can be extremely embarrassing and worrying. This is referred to as blushing and is usually a normal response if embarrassed, angered or experiencing distress or any other strong emotions. Flushing of the face may be accompanied by redness on the neck, arms and chest. This occurs due to dilation of the blood vessels under the surface of the skin. Redness of the face, sweating, feeling hot, itchy skin and blisters on the face are common facial symptoms that accompany a flushed face. However, there are also some additional symptoms that may occur rarely with flushing. These include anxiety, dizziness, diarrhea, fatigue and heart palpitations. If the flushing is not experienced only momentarily and if the flushing is accompanied by some or the rarer symptoms mentioned above, it may be a result of an underlying medical condition that require medical treatment. Flushing in the face is induced by the blood rushing through the blood vessels under the surface of the skin, and can be the result of a wide variety of causes. Below are some of the most probable causes of why you may get a flushed face. Emotion – Extreme happiness, excitement, anger, high levels of physical exertion or sexual arousal can cause the face to flush. These emotions raise the heartbeat, thereby increasing the blood pressure to the face. The redness seen in peoples' faces when they experience any form of emotion is caused by blood rushing to the brain that obviously bypasses the face on its way up. 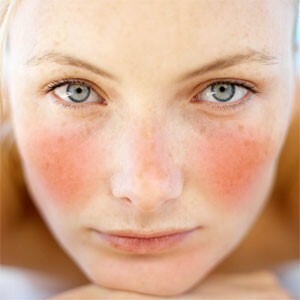 Temperature – Extreme cold and harsh winds can result in a flushed, rosy face. This occurs when the body tries to regulate the temperature to keep the internal organs warm. Although extreme cold resulting from hypothermia causes the face to become blue, exposure to cold winds will leave your face with a flushed appearance. High Blood Pressure – Flushing of the face could be caused by high blood pressure or hypertension. This occurs due to clogged or narrowed arteries that are unable to pump blood. A flushed face occurs because the heart pumps harder and raises the blood pressure. Menopause – Facial flushing is extremely common in women going through menopause. This is most often accompanied with hot flashes. This is because the hypothalamus fools the brain into thinking that the body temperature is too high. This causes the brain to increase blood flow resulting in a flushing face and feeling of heat. The changes in body heat are compounded with the drop in estrogen production during menopause. Exercise – Flushing is common when doing strenuous exercises. This increases the heart rate and blood pressure. The heart rate and blood pressure increase when the body adjusts the blood flow to carry excess oxygen and blood to the muscles. Flushing face results from the fast circulation of blood to carry out the demands of the body during exercise. Alcohol – Excessive alcohol consumption causes redness in the face. Although alcohol is not a stimulant, it causes the dilation of blood vessels, thus resulting in a flushed face. Relief from facial flushing depends on what is causing the flushing. Some causes, like menopause and redness of the face when exercising, is beyond control. Similarly, any flushing due to emotions will be momentary. However, as mentioned above, if a flushed face is due to the acceleration of the heartbeat and pressure, then take measures to keep the heart rate down and the blood pressure at normal levels. Avoid exposure to cold windy as well. Medical advice may be necessary if the cause of the flushed face is unknown. For example, carcinoid syndrome, a rare disease may cause the redness of the face. This occurs due to a tumor in the lungs or digestive tract that causes the dilation of the blood vessels. Common problems with light skin that flushes easily can be managed with a bronzer or a tan. Cooling off with a hand-held fan or iced water may also prevent excessive flushing of the face.